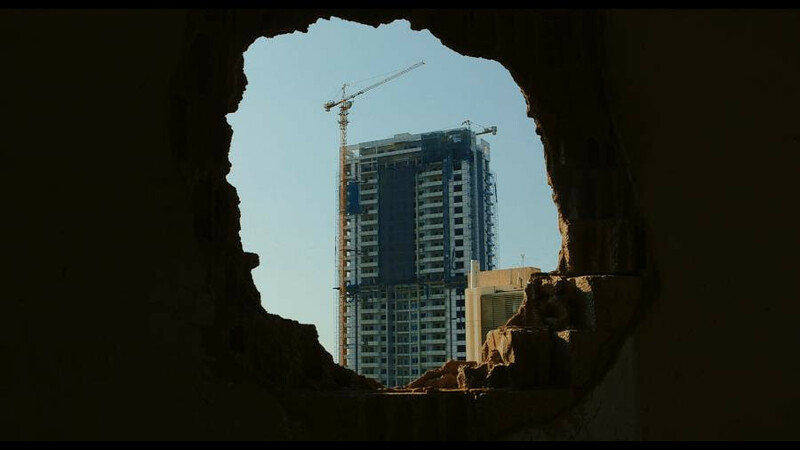 The documentary Taste of Cement, directed by Ziad Kalthoum, had it’s Montreal premiered on Nov. 17 by Cinema Politica at Concordia University’s SGW theatre. As I waited in the line which snaked along the first floor of the Hall building, I wasn’t sure what to expect. I’d never been to a Cinema Politica screening, but I was in high anticipation after I’d seen the film’s trailer which was filled with a mix of loud chaos and unsettling quiet. The screening was co-presented with the McGill Syrian Students’ Association, the Concordia Syrian Student Association, and the Immigrant Workers Centre. Taste of Cement featured the lives of Syrian refugee construction workers who were building a highrise in the middle of Beirut, Lebanon. They were rebuilding the city on the ruins of the Lebanese civil war, while their own country was crumbling because of destruction and chaos. “The workers in Lebanon have a lot of similarities to that of the reality of temporary foreign and migrant workers here in Quebec, and largely in Canada,” said Mostafa Henaway, a community organizer of the Immigrant Workers’ Centre. In the film, there was no dialogue between the construction workers. For the most part, there was only narration. The use of silence was an enigmatic trope throughout the documentary. The film weaves through the everyday lives of the construction workers on the site. Kalthoum, who is a Syrian refugee himself—currently based in Germany—walks us through their back-breaking day, backdropped by the gorgeous city of Beirut, and the dizzying heights. We also get an immersive experience of their lives after their workday is done. They are living with restricted work permits and abide strict rules and a strict curfew at 7 p.m.. They need to be indoors by that time, otherwise they will be punished by law. Syrian refugees are reportedly poorly mistreated in Lebanon, a country in which the United Nations has registered more than 1 million Syrian refugees. The construction workers of the film have no connection to Beirut and its peoples, they only work in exile. This was exemplified by the lone island feel of the highrise building against the bustling city of Beirut. They reside in the basement of the building they are working on in poor conditions, the news from their country through the media on their smartphones. That scene in particular was mesmerizing. The sound of the overlapping media pervades their silence; they wore forlorn expressions as they watched the realities of their home country, in the blueish light, surrounded by walls of cement. Kalthoum said he and his team had 15 days in Beirut to shoot all of the material he needed for the documentary. During that time, he shadowed their footsteps. He and his team spent a few nights in the basement of the building where the workers lived and slept. The construction contractors found out, however, and kicked them out. The film is superimposed with shots of Syria, of rummaging through rubble, and of the destruction and chaos that most of their country is currently going through. The script was lyrical and poetic.The silences were encompassing and appropriate. This served as a technical mechanism of the film. The film had moments of painful silence from the Syrian migrant workers. Between the bouts of silence, though, there were the deafening sounds of construction, the shaking sound of explosions and destruction, and the cries of the survivors after an attack. With the first sound of an explosion, I jumped in my seat. There was a clip of four bombs making their way from the planes to touch the ground, slowly, mesmerizing, and silent. It’s difficult to describe the pain depicted in the film, of the Syrian migrant workers with their repetitive, reclusive routine, to the destruction in Syria. All the audience could do was watch. And listen. And learn. Kalthoum wanted to create this film about the Syrian-refugee workers in Lebanon because they focused their lives on building, not destroying, he explained. It was important for him to focus on this group, because on the news and in the media in general, there are stories everyday covering the fighting in Syria, and little more about his country. No one moved as the credits rolled. Everyone’s bodies were folded in place. There was a sobering silence, as the sound of the waves lightly rolled over the audience.